This article is about a car model produced by the Korean car manufacturer Hyundai. For the Hyundai marque, see Genesis Motor. It has been suggested that this article be merged with Genesis G80. (Discuss) Proposed since July 2018. It was introduced in concept form at the 2007 New York International Auto Show and was internally designated as the BH model. It was expected to cost $533 million to develop. Hyundai began marketing the first generation Genesis worldwide (with the exception of Europe) in 2008, as a "premium sports sedan". The second generation Genesis (internally designated as model DH) debuted in Seoul, Korea in November 2013 followed by the 2014 North American International Auto Show and Toronto Auto Show. It is marketed worldwide. The name Genesis reflects Hyundai's first entry into the luxury market segment. On 4 November 2015, Hyundai officially announced the Genesis brand will be spun off into Genesis Motor, the new luxury vehicle division for Hyundai. The leap into a stand-alone, luxury brand comes on the heels of marked success in the luxury market, paired with consumer demand for the Genesis name. The Hyundai Genesis was rebranded in 2017 as Genesis G80. Introduced in March 2007 as the "Concept Genesis", the sedan was designed by Hyundai as a "progressive interpretation of the modern rear-wheel drive sports sedan". Hyundai conceived the idea for the Genesis in 2003. The body design took three years and the total cost of the program was $500 million over a development period of 23 months. Reliability testing ran for 800,000 miles. Hyundai reportedly benchmarked the BMW 5 Series (E60) sedan during the Genesis' development; the company's press release indicates the Genesis body in white exceeds the BMW in torsional rigidity by 14%. The production Genesis sedan received a five-star crash rating in every category from the National Highway Traffic Safety Administration. Hyundai markets the Genesis as offering "the performance of a BMW 5-Series and the interior packaging of a 7-Series at the price of a 3-Series". Reviewing the Genesis 4.6 at its US introduction, automotive journalist Dan Neil called the absence of brand emblems at the front of the Genesis "a move that subverts the grammar of luxury". The Genesis was announced in Seoul and later unveiled at the 2008 North American International Auto Show. The first generation was marketed worldwide except in the European market. Equipment included a speed-sensitive rack-and-pinion steering, four-wheel disc brakes, multi-link front and 5-link rear suspension; and three engine choices, depending on market: A V8 with weight distribution of 53% front / 47% rear and two V6 engines with 52% front / 48% rear weight distribution. At introduction in the US, standard features included cruise control, automatic headlights, dual-zone automatic air conditioning, leather seat-upholstery and steering wheel, heated front seats with power adjustments, power windows, door locks, and mirrors, remote keyless entry and starting, and a seven-speaker audio system with XM satellite radio. Two optional Lexicon-branded audio systems offer 7.1 channels and 14 or 17 speakers. The Tau V8 is Hyundai's first domestic V8 engine. For the 2008–09 model years, the 4.6 L engine produced 375 hp (280 kW) at 6,500 rpm and 333 lb⋅ft (451 N⋅m) at 3,500 rpm. Introduced as a midyear change for the 2010 model, the 4.6 L V8 now produces 385 hp (287 kW) at 6,500 rpm, with no change in the torque output: 333 lb⋅ft (451 N⋅m) at 3,500 rpm. These figures are achieved using premium fuel. The V8 can also run on regular unleaded, in which case the 2010–11 model produces 378 hp (282 kW) and 324 lb-ft. For the V8 model, Hyundai has reported 0–60 mph (97 km/h) times of less than 6 seconds. Car and Driver reports a 0–60 mph time of 5.3 seconds while Motor Trend reports a 0–60 mph time of 5.5 seconds in their October 2008 issue. The Lambda 3.8 L V6 is available in Korean and North American models. In Korean spec, the engine produces 306 hp (228 kW). In US spec this engine produces 290 hp (216 kW) at 6,200 rpm (up to 333 hp in GDi spec) and 264 lb⋅ft (358 N⋅m) at 4,500 rpm. Motor Trend reports a 0–60 mph time of 5.9 seconds. The Lambda 3.3 L V6 is available in some markets, producing 264 hp (197 kW). In North America, the 2009-2011 V8-powered Genesis features a standard ZF 6HP26 6-speed automatic transmission from ZF Friedrichshafen (same as the unit found in the 2004-2010 BMW 5 Series), with the V6 models receiving an Aisin B600 6-speed automatic. The recommended gasoline for the V8 is premium for maximum fuel economy and horsepower, but also runs on regular. The V6 engine is designed for regular grade gasoline. South Korean models include choice of Lambda 3.3 GDi, Lambda 3.8 GDi engines. US models include choice of 3.8 Lambda GDi, Tau 4.6 MPi (390PS), 5.0 Tau GDi engines. Canadian models include choice of 3.8 Lambda GDi, 5.0 Tau GDi (R-Spec only) engines. Standard safety features include dual front airbags, front and rear side airbags, side-curtain airbags, ABS, brake assist, EBD, traction control, and electronic stability control. As part of the US product launch, Hyundai Motor America and Carbonfund.org unveiled the Genesis Forest Project at the 2008 Los Angeles Auto Show, to offset the entire first year of emissions for all 2009 Hyundai Genesis sedans sold in the United States. The Genesis Forest Project was retroactively applied to all 2009 Genesis sedan sales, which began in June, and continue through the end of the year. The Premium Navigation Package replaces the previous Premium Plus Package which most notably upgraded to 18-inch alloy wheels, still a part of this new package. For 2010 the 4.6-liter Genesis was available in only one trim, with all packages made standard, including the Technology package. The car also received a slightly uprated engine as a midyear change, with the 4.6-litre V8 producing 385 hp (287 kW) at 6500 rpm and an identical 333 lb⋅ft (451 N⋅m) of torque at 3500 rpm. US model was released as 2012 model year vehicle. Engine choices include 3.8 Lambda GDi, 4.6 Tau MPi (390PS), 5.0 Tau GDi for R-Spec. The transmission was changed to 8-speed automatic with SHIFTRONIC. This model includes the new Tau 5.0 GDi engine, choice of three exterior colors and black interior. Genesis 5.0 R-Spec includes Genesis 4.6 equipment, plus 19-inch Premium Machined Finish alloy wheels with P235/45R19 tires, Unique headlamps w/dark chrome inserts, Sport-tuned suspension calibration, Unique R-Spec embroidered floor mats, R-Spec rear deck lid badging, deleted woodgrain from leather steering wheel. The vehicle was unveiled in Seoul. All models include 8-speed automatic transmission with SHIFTRONIC manual mode. The last changes to US models before the new generation was introduced included greater connectivity options via the Hyundai Blue Link interface, some revised controls, a new exterior body colour (Santiago Silver instead of Platinum Metallic), 18-inch wheels as standard on the base model, and Hyundai’'s Assurance Connected Care telematics services are standard for three years on all 2014 Genesis sedans equipped with Blue Link. The second generation Genesis was previewed by the "Hyundai HCD-14 Genesis" concept at NAIAS 2013. The vehicle was unveiled in Seoul, Korea, followed by the 2014 North American International Auto Show, then the 2014 Toronto Auto Show. Early models include a choice of four engines (Lambda 3.0 GDi, Lambda 3.3 GDi, Lambda 3.8 GDi, Tau 5.0 GDi), rear or all-wheel-drive. All models include eight-speed automatic transmission with manual shift mode and a five star safety rating. A full production version went on sale in South Korea on 8 January 2008 in Hyundai's home market, South Korea. Notably, the Korean market Genesis does not carry a Hyundai badge, only the 'Genesis' emblem. Hyundai has been criticised by Korean consumers over the price discrepancy between the US and Korean markets. Yonhap reports the Genesis costs "₩58.3 million (US$57,000) in Korea, whereas in the U.S. it sells for $32,000." This has led to dumping allegations and a growing market in reimported Genesises by gray market dealers. Korean regulators are currently investigating whether Hyundai has abused its 75% domestic market share. However, Hyundai cars in South Korea have more available options and that may be the reason for the mark-ups. Marketed as the Hyundai Genesis in the US and Canada, the vehicle is the largest, most powerful car that Hyundai has ever marketed there before the launch of the Equus. The Genesis sedan went on sale in the US in August 2008. In its first five months of sales, the Genesis under-performed in the competitive US market selling only 6,167 units. According to Hyundai, Genesis saw sales of just 1,297 units in its first full sales month and the company expected to move around 8000 units from the US showrooms by the end of 2008. In 2009, the Genesis sold 21,889 units in the U.S. (sedan and coupe combined). 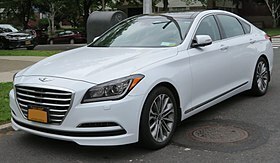 There had been internal discussions within Hyundai about creating a separate brand to feature the Genesis sedan as well as the soon to come Equus sedan in North America, but due to prohibitive costs and potential delays the Genesis and Equus remained tagged with the Hyundai brand until 2016. In late 2016, The Genesis brand became separate from Hyundai in the United States. Sold as Hyundai Rohens in China, the unveiling was at the Beijing International Automotive Exhibition, 2008. Sales began in August 2008. The Genesis was not marketed at first in Europe because of Lexus's failure to thrive in Europe. According to a September 2007 article in Tradingmarkets.com, " in the eyes of European purchasers of luxury vehicles, Hyundai sedans have been perceived as having a poor image and unreliable durability compared with its rivals." "The planned launch of Genesis comes at a time when Hyundai is striving to shake off its poor-brand image, known for generous warranties and low prices." The latest Genesis will be sold in Europe, priced at about €65,000 in Germany. The Genesis is sold in Latin America in Costa Rica, Dominican Republic, Colombia, Chile and Peru, offering versions with engines of 3.3 and 3.8 liters, and in Brazil only with the 3.8 liters engine. Australia was the first country in the region to get the Genesis sedan, arriving in November 2014. A rear wheel drive sports car from Hyundai, dubbed Hyundai Genesis Coupe and sharing the Genesis Sedan's platform and name, was unveiled at the 2008 New York International Auto Show. According to Edmunds.com in 2009: "With badges removed, the Genesis could easily pass as a Lexus or Mercedes-Benz, although we doubt many brand-conscious people would give a Hyundai a second glance." According to the editor-in-chief blog of Motor Trend, "Hyundai Genesis: A Car Detroit Can Now Only Dream of Building? ", The Genesis came close to winning the 2009 Motor Trend Car of the Year title. AutoPacific's 2009 consumer Vehicle Satisfaction survey of Hyundai owners placed the Genesis at the top of its class in Awards (VSA) research. Named "Best Luxury Sedan" in MotorWeek's 2009 Driver's Choice Awards. Named 2009 North American Car of the Year, the first for Hyundai. Won 2009 Canadian Car of the Year after winning its category of Best New Luxury Car under $50,000. Won 2009 Car of the Year award by China's Autoworld magazine. Hyundai's V8 Tau engine received 2009 Ward's 10 Best Engines award. Based on automotive journalist reviews, The Genesis received a score of 89% on Seven Car Garage, making it one of the best reviewed cars in its class. ^ "Hyundai Comes Out Swinging for Genesis". Insideline.com. 4 February 2008. ^ a b c "South Korea's Hyundai Motor launches Genesis luxury car in foray into high-end market". SignonSanDiego.com, Kelly Olsen, AP. 8 January 2008. ^ a b c "2009 Hyundai Genesis". NCTD.com. ^ "Hyundai spins off Genesis luxury brand, promises six new models by 2020 - CNET". CNET. Retrieved 5 November 2015. ^ "LUXURY EVOLVED, GENESIS". genesis.com. Retrieved 5 November 2015. ^ "Hyundai Accelerates Genesis into Its Own Luxury Brand". Yahoo!. Retrieved 5 November 2015. ^ Kim, Sohee (4 November 2015). "Hyundai launches Genesis premium car brand in bid to end profit skid". Reuters. Retrieved 5 November 2015. ^ "Hyundai to Unveil Concept Genesis Premium Sports Sedan" (Press release). PR Newswire. 26 March 2007. Retrieved 12 September 2008. ^ Jonathon Ramsey (17 June 2008). "Let there be technology: What's under Hyundai's new Genesis sedan". Autoblog.com. ^ a b "2009 Hyundai Genesis". Topspeed, 8 January 2008. ^ Evans, Scott (27 August 2008). "2009 Hyundai Genesis receives five-star crash ratings from NHTSA". Motor Trend. Retrieved 12 September 2008. ^ "Preview: 2009 Hyundai Genesis". Autos.canada.com. 17 July 2008. Retrieved 10 May 2009. ^ "2009 Hyundai Genesis: Luxury at a deep discount". Los Angeles Times. 21 November 2008. ^ "Genesis Luxury Sports Sedan Opens a New ERA for Hyundai". Hyundai Motor Company. ^ "Hyundai Unveils Genesis Premium Sports Sedan". Hyundai Motor Company. ^ a b c "2009 Hyundai Genesis Specs". JB car pages. Retrieved 22 August 2008. ^ "2009 Hyundai Genesis Features". JB car pages. Retrieved 22 August 2008. ^ a b "2011 Hyundai Equus Press Release". Hyundai Motor America. Archived from the original on 4 April 2010. Retrieved 11 July 2010. ^ Eric Bryant (4 April 2007). "New York Auto Show: Hyundai starts over with the Genesis". Autoblog.com. ^ "2009 Hyundai Genesis 4.6 – Long-Term Road Test Intro". caranddriver.com, July 2009. ^ Ougarov, Kirill (7 July 2009). "Advanced Arithmetic: Addition by Subtraction?". Motor Trend Online. Retrieved 14 October 2009. ^ "2009 Hyundai Genesis Review". JB car pages. Retrieved 22 August 2008. ^ "Safercar.gov". Safercar.gov. Archived from the original on 17 September 2008. Retrieved 10 May 2009. ^ a b "2009 Hyundai Genesis Named 'Top Safety Pick' by IIHS". Hyundai Motor America. PR Newswire. 30 April 2009. Archived from the original on 22 May 2009. Retrieved 10 May 2009. ^ "IIHSHLDI: Hyundai Genesis". Iihs.org. 24 February 2009. Retrieved 29 January 2012. ^ "2012 Hyundai Genesis priced from $34,200; new 5.0 R-Spec to start at $46,500". autoblog. ^ "2012 HYUNDAI GENESIS OFFERS ITS MOST POWERFUL V8 POWERTRAIN WITH FURTHER DESIGN AND CHASSIS REFINEMENT – New 5.0-liter V8 R-Spec Model, Enhanced Direct Injection V6 Engine and New Eight-speed Transmissions Significantly Improve Driving Dynamics and Refinement". Hyundai News. ^ "2012 Hyundai Genesis sedan gets new 5.0L V8, upgraded V6". autoblog. ^ "Hyundai New Genesis Enjoys Hot Sales". Korea Economic Daily. 18 December 2013. Archived from the original on 30 December 2013. ^ "Avtotor began to produce three Hyundai cars". Wroom.ru. Archived from the original on 17 June 2016. Retrieved 22 May 2016. ^ Kennedy, Ewan (1 July 2014). "2015 Hyundai Genesis review". CarsGuide. Retrieved 9 January 2015. ^ "Design number: 001399810-0001". Office for Harmonization in the Internal Market. 23 December 2013. Retrieved 9 January 2015. ^ "2013 HCD-14 Genesis". worldwide.hyundai.com/. Hyundai Motor. Retrieved 19 January 2015. ^ "New Hyundai Genesis Emblem Revealed and V8 Confirmed". Wordcarfans.com, Frank de Leeuw van Weenen. 4 December 2007. ^ Melian, Borla. "Hyundai and KIA: analysis of a dumping accusation". Retrieved 26 November 2012. ^ "S. Koreans reimport Hyundai Genesis from cheaper US market". ^ "Hyundai Genesis sales expected to reach 50,000 units". Archived from the original on 21 September 2008. ^ "Hyundai Motor America Reports December and Full-year 2009 Sales". California. PR Newswire. Retrieved 8 October 2010. ^ "Interview with Jim Trainor, National Manager of Product Public Relations, Hyundai Motor America". ^ "A turning point for Hyundai next year". ^ "Hyundai Genesis not going to Europe". Topspeed, Simona. 31 March 2008. ^ a b "Hyundai Motor is not considering selling premium car Genesis in Europe". Tradingmarkets.com. 20 September 2007. Archived from the original on 25 November 2007. ^ Strong residual value allows for attractive Hyundai Genesis lease deals, egmCarTech.com, 14 July 2008. ^ "Surprise: Hyundai proves it's a master of luxury with Genesis", USA Today, 10 November 2008. ^ "Hyundai Genesis Outscores Competitors, Becomes Consumer Reports' Top-Rated 'Upscale". Reuters. 5 January 2009. ^ "Edmunds.com review and description of the Gensis as a luxury sedan". Retrieved 19 September 2008. ^ Hyundai, Ford win '09 car and truck awards. Retrieved 11 January 2009. ^ a b c d e Hyundai Genesis is Class of the 2009 Model Year With Most Top-Car Honors[permanent dead link], Fox Business, 27 August 2009. ^ Hyundai Genesis Named 2009 Cars.com New Car of the Year, Reuters.com, 3 February 2009. ^ Hyundai Genesis Named One Of The "Best New Cars Of 2009", 23 January 2009. ^ Hyundai Genesis Named Car of the Year by On Wheels Media at the 13th Annual Urban, Reuters.com, 14 January 2009. ^ HYUNDAI GENESIS NAMED TO NADAGUIDES.COM 2009 TOP LUXURY CAR LIST Archived 5 January 2010 at the Wayback Machine, hyundainews.com, 8 December 2008. ^ FOUR HYUNDAI MODELS HONORED WITH "BEST BET" AWARDS FROM THE CAR BOOK 2009, Press Release Point, 6 February 2009. ^ "Consumers Digest Magazine Names 2009 Automotive Best Buys". Consumers Digest. PR Newswire. 31 October 2008. Archived from the original on 1 October 2009. ^ Hyundai cars gain ground in U.S. used market, The Korea Herald, 24 February 2009. ^ "Hyundai's Genesis sedan earns another accolade" Archived 15 December 2014 at the Wayback Machine, Montgomery Advertiser, 25 November 2009. ^ "2009 North American Car of the Year". NACOTY. 11 January 2009. Archived from the original on 3 February 2014. ^ "2009 Canadian Car of the Year" (PDF). Automobile Journalists Association of Canada, 24 October 2008. ^ "Ward's 2009 10 Best Engines Winners". WARD'S. 5 December 2008. Archived from the original on 26 September 2011. Retrieved 15 January 2009. Wikimedia Commons has media related to Hyundai Genesis.